Copyright: Artists grant Fusion Art a non-exclusive perpetual license to reproduce the images of your artwork on our website, in the marketing of any art competitions including, but not limited to, on the gallery’s social media network outlets, and to advertise the annual group exhibition that will take place in Palm Springs, CA each November beginning November 2016. Entry fee: $25 for up to 2 images and $10 for additional image. 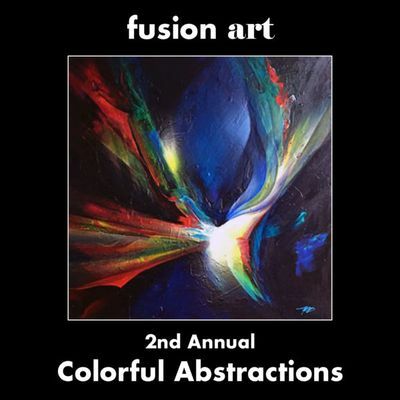 For this competition artists and photographers worldwide are encouraged to share their artistic interpretation of the “Colorful Abstractions” theme by submitting their best nonobjective or nonrepresentational art. Abstraction is defined as “freedom from representational qualities in art.” Abstract art is art that “does not attempt to represent external reality, but seeks to achieve its effect using shapes, forms, colors, and textures.” Black and white are colors that qualify for the Colorful Abstractions theme. All artists and photographers, regardless of location or experience, are encouraged to submit. You may enter up to 5 images. Judging criteria: creativity, originality, interpretation, quality, overall design, demonstration of artistic ability, and usage of your chosen medium. Image requirements: jpeg format, 96 dpi; under 3 Mb in file size.